Khaled Meshaal is the former chief of Hamas’s political bureau. He stepped down after two terms in that position following the May 6, 2017, election of deputy Hamas leader Ismail Haniyeh.“Ismail Haniyeh elected new political head of Hamas,” Times of Israel, May 6, 2017, http://www.timesofisrael.com/ismail-haniyeh-elected-new-head-of-hamas/?utm_source=The+Times+of+Israel+Daily+Edition&utm_campaign=0dd24464cd-EMAIL_CAMPAIGN_2017_05_05&utm_medium=email&utm_term=0_adb46cec92-0dd24464cd-55118405. Meshaal assumed leadership of the political bureau in 2004 following the assassinations of Hamas founder Ahmed Yassin and his successor, Abdel Aziz Rantisi. 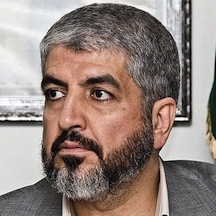 During his 13 years of leadership, Meshaal oversaw Hamas’s transition from a purely terrorist organization into a terrorist/political hybrid.“Khaled Meshaal Fast Facts,” CNN, October 9, 2014, http://www.cnn.com/2014/10/09/world/meast/khaled-meshaal-fast-facts/index.html. Despite Hamas’s control of Gaza, Meshaal has never lived there. He resides in Qatar, from where he acted as the public face of Hamas for more than a decade. Reports in January 2015 speculated that Qatar would expel Meshaal and other Hamas leaders as part of a plan to align with its regional allies in the fight against terrorism.“Report: Qatar to banish Hamas’ Meshaal, who will relocate to Turkey,” Jerusalem Post, January 6, 2015, http://www.jpost.com/Middle-East/Report-Qatar-to-banish-Hamas-political-bureau-chief-Mashaal-who-will-relocate-to-Turkey-386808. Qatar denied the reports and Qatar’s top diplomat called Meshaal a “dear guest” in his country.Abdullah Rebhy, “Qatar denies it plans to expel Hamas leader Khaled Meshaal,” Associated Press, January 12, 2015, http://bigstory.ap.org/article/04fc2928f3e04a77a1fdd45c24085397/qatar-denies-it-plans-expel-hamas-leader-khaled-mashaal. Avi Issacharoff, “Rising new Hamas leader is all too familiar to Israel,” Times of Israel, December 18, 2015, http://www.timesofisrael.com/rising-new-hamas-leader-is-all-too-familiar-to-israel/. “New Hamas policy document ‘aims to soften image,’” BBC News, May 1, 2017, http://www.bbc.com/news/world-middle-east-39744551. In his farewell address, Meshaal said that Haniyeh and Hamas’s political bureau would continue to focus on the “key” issues of “liberation, Jerusalem, prisoners, right of refugees, lifting the siege imposed on Gaza, and achieving internal unity.”“Khalid Meshal's speech during the inauguration of the new head of Hamas political bureau, Ismail Haniya ( an excerpt),” Hamas website, May 6, 2017, http://hamas.ps/en/post/694/khalid-meshal-s-speech-during-the-inauguration-of-the-new-head-of-hamas-political-bureau-ismail-haniya-(-an-excerpt). Australia designated “Khaled Meshaal” on November 21, 2003.“Consolidated List,” Australian Government Department of Foreign Affairs and Trade, last updated September 12, 2017, http://dfat.gov.au/international-relations/security/sanctions/pages/consolidated-list.aspx#list. The United Kingdom proscribed “Khalid Mishaal” on March 24, 2004.“Consolidated List of Financial Sanctions Targets in the UK,” U.K. Home Office, last updated September 12, 2017, http://hmt-sanctions.s3.amazonaws.com/sanctionsconlist.htm. The U.S. Department of the Treasury designated “Khalid Mishaal” as a Specially Designated Global Terrorist on August 22, 2003.“U.S. Designates Five Charities Funding Hamas and Six Senior Hamas Leaders as Terrorist Entities,” U.S. Department of the Treasury, August 22, 2003, https://www.treasury.gov/press-center/press-releases/Pages/js672.aspx. Khaled Meshaal is the former chief of Hamas’s political bureau. “The popularly elected Egyptian leadership is giving everyone a lesson. The Egyptian leadership has shown that it is taking a new course and adopting a new vision. The era when Israel did what it pleased is over.” David D. Kirkpatrick and Mayy El Sheikh, “Israeli Attacks Are Test of Loyalty for Egypt’s Morsi,” New York Times, November 15, 2012, http://www.nytimes.com/2012/11/16/world/middleeast/israels-gaza-strikes-test-egyptian-leader.html. “The weapons of Palestinian resistance were partially manufactured inside the Gaza Strip, and the rest was supplied by certain countries, including Iran.” “Iran Supplied Gaza with Weapons - Hamas Political Leader,” RIA Novosti, November 22, 2012, http://en.ria.ru/world/20121122/177653686.html. “Israel committed itself to lift the blockade of the Gaza Strip and stop killings. The latest Israeli aggression showed that resistance is the ideal choice for establishing a Palestinian state. The results we have achieved are a victory for all Palestinians and a victory for the Arab nation.” “Iran Supplied Gaza with Weapons - Hamas Political Leader,” RIA Novosti, November 22, 2012, http://en.ria.ru/world/20121122/177653686.html. “We agree on the [Palestinian] state with the borders of June 4, 1967, Jerusalem as its capital, fully sovereign without settlements, the right of return, but without the recognition of Israel.” “Hamas: No Plan to Recognize Israel,” CNN, April 21, 2008, http://edition.cnn.com/2008/WORLD/meast/04/21/carter.hamas/index.html. “We don't deny the Holocaust, but we believe the Holocaust was exaggerated by the Zionist movement to whip people.” Tim Marshall, “Hamas Leader Talks Exclusively To Sky,” Sky News, March 31, 2008, http://news.sky.com/story/591531. “The Israeli state is the aggressor and the occupier. The Palestinians are the victims, so who should recognize whom?” Steven Lee Myers and Greg Myre, “Hamas Delegation Visits Moscow for a Crash Course in Diplomacy,” New York Times, March 4, 2006, http://www.nytimes.com/2006/03/04/international/middleeast/04hamas.html. “We will stop targeting Israeli civilians when Israel stops its aggression against Palestinian civilians.”“SPIEGEL Interview with Hamas Leader Khaled Mashaal: ‘Our People Will Never Rest,’” Spiegel Online, February 6, 2006, http://www.spiegel.de/international/spiegel/spiegel-interview-with-hamas-leader-khaled-mashaal-our-people-will-never-rest-a-399153.html. “Before Israel dies, it must be humiliated and degraded. Allah willing, before they die, they will experience humiliation and degradation every day.” ““Hamas Leader Khaled Mash’al at a Damascus Mosque: The Nation of Islam Will Sit at the Throne of the World and the West Will Be Full of Remorse When It Is Too Late,” MEMRI - The Middle East Media Research Institute, February 3, 2006, http://www.memritv.org/clip_transcript/en/1024.htm. “We say to this West, which does not act reasonably, and does not learn its lessons: By Allah, you will be defeated. “Hamas Leader Khaled Mash’al at a Damascus Mosque: The Nation of Islam Will Sit at the Throne of the World and the West Will Be Full of Remorse When It Is Too Late,” MEMRI - The Middle East Media Research Institute, February 3, 2006, http://www.memritv.org/clip_transcript/en/1024.htm.